Ever feel like your train of thought has been derailed? It’s been a tough spring personally. A lot of changes all at the same time have made everything feel like it’s not quite stable. Much of it has been good – but it’s draining me energetically and physically. Somehow that seems mildly ironic as in February my glucose was averaging around 400-450 and now it is down around 140-160. I’ve lost and kept off 30 pounds since January. My blood pressure is great. But, along the way, self-doubt has crept back in insidious ways. I can feel its paralyzing effects and am doing the best I can to fight back. Literally. I am finally back doing taekwondo. Almost 4 years ago Steph Stowe dragged my out of shape tush and extremely depressed brain to Zumba®. I fell in love and said I wanted to do that to get back to TKD. Along the way I started to TEACH Zumba®. I had two classes a week that I taught using a chair. People from 4-86 came each week and loved it – and I loved them. It was a personal challenge to teach. Almost every class I walked in wondering “Who the heck am I to be teaching a fitness class? I’m fat, out of shape and far from the fitness ideal.” I did it for them; I did it for me. In February, I started back to taekwondo. More than a decade since I had stopped training. I’d forgotten the patterns. But remember the feelings. How much it challenged me, how much it let me get moving physically and mentally, how much it let the emotions I didn’t want to admit were there move. I am back at it again. 50 pounds heavier than when I stopped. I’m in my 40s. The drills are different, and the students are different and my instructor is different. The kicks are the same. The patterns, rusty and dusty from lack of use, are there and will slowly come back. One thing that has remained the same in deeply personal way for me is the fact that the sparring partner who challenges me most in this is me, my own brain. I leave class tired, sweaty, proud. And more often than not experiencing a flood of feelings that truly have nothing to do with class other than that the movement and focus allows them to come out of the tidy cubbies I want to stuff them into. Some nights its pride. Some nights it is just an overwhelming sadness. Some nights it is feeling strong. Tonight, it is sitting with the question that has haunted me the past few weeks… “Can I keep up? Can I do this? How do I do this?” It has shown up in so many places and ways – both large and small. This is where I must exercise my indomitable spirit – keep persevering… lean in and lean on where I can. So many things in my life seem to have come together in a transformational conflagration. All coming together to shine a bright, unyielding, demanding light on my life. I saw things in a new light… And now, hours later, am still feeling them. I need to learn the following, and more than learn… Believe. That for all the world, in many ways I do feel I am what I do, not who I am. I need to switch that. That I have learned far too well how to turn the pain off… And experience it later, at a time of my choosing. that despite all the things people tell me I do well, or where they say I’ve inspired them – I find I dismiss or turn them off. Who Says A Yellow Streak Means You’re a Chicken? Amazing the things that make you feel ten feet tall. Three inches of 1/2″ wide duct tape made my night on Monday. 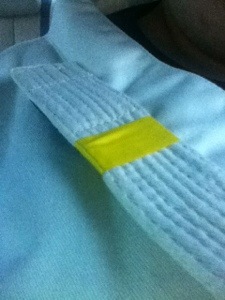 Earning my yellow stripe for a second time meant as much if not more than it did the first time around. Still riding high from this weekend’s visit with a ZIN Jammer from Connecticut. Jenny Kraus is super cute energetic and had some great routines for us. It was just the thing needed for this morning. Today, Lori and I are heading out to meet with the folks from Dragonheart and Survivorship Now to talk about Zumba Gold classes. I’m totally honored, humbled and happy to have this chance. Game on today!! So it is almost a year I have been leading Zumba Fitness classes. When I started this journey 2 years ago, I didn’t expect it would take a year to feel ready to have my own class. To start out with I would volunteer to teach in a women’s prison. Or maybe not. Diane Felkenes came to Vermont just about 11 months ago. And she rocked my world. I wanted to teach an athletic chair class, would open it to seniors and survivors . 30 minutes of Latin and world music. An occassional piece by Belefonte…but mostly feel good AfriBolliCaribaxe. Music from the places, sharing another side of joy. Most of my music is around joy and feeling uplifted. Now I teach 2 classes on my own… On seated and one standing, I help with a third, I’ve worked some large events, cohosted Diane Felkenes. All the while, I’m not getting paid. White it would be nice to make back trainings and insurance cost I work in a tough spot. Some weeks these women have nothing to spare. $3.75 seems too much for full turkey dinner with all the fixings. It means less of something else…. Maybe toilet paper. I can’t ask people to make those kinds of choices…,I’d rather they were in class free of worry about where the money comes from. On a big week I make $10-15 teaching an 8-10 person class. I give it all back to the senior center who is also coins money. My initial training was paid for and this lets me give back to the community. I love the boys (4 years old), men and women of class. They make me smile even in Grmpy Gus Grove days. About 5 years ago, Tiffany Bluemle and Vermont Works for Women entered my world. I was part of a small group that was partnered with VWW for a 6 month Leadership Project. I was an administrative assistant taking part in a community leadership program, hell bent on never hearing that I had no leadership skills in an interview ever again. I fell in love with the VWW organization and their vision. I even swore that one day I would work there. We finished the project… And passed of our research, marketing ideas, etc. Time passed. As I prepared to leave a job I’d been in for almost 10 years, it was Tiff I was talking to. I needed out of the job I was in. But in talking with her, I knew I was doing the right thing. I moved on to another job, but stayed in touch occasionally. By now I had joined the TB admiration society. After about a year and a half at the new job things fell apart. Horrifically. I was depressed. Angry. Suicidal. things at home were chaos. A longtime friend had moved in with us on his return from serving in Iraq. I was a wreck, and there was absolutely no stability in my world. I quit my job. Left with my head low, my spirits lower, and no clue what was next. It took about 3 weeks to work up the nerve to call Tiff. We’d do lunch. At that point, I was in a total free fall. But just sitting there and listening over Ginger Iced Tea… I felt a little more alive. Still broken and not sure what was next, but certain that there WAS a next. About a month later, she called. Their Development Director was leaving, could I temp for about 6 weeks? Hell yeah! It’s now two years later, and while there have been days that I’ve left sad angry or drained…. They are days, not months on end. I find myself with each passing day loving the women I work with, their faith – in me, in the participants, in the greater community, their vision. I feel like a walking testimonial to those very words we chose to describe what we do: building confidence, teaching skills, changing lives. VWW, and more specifically, Tiff have really transformed my world – there is more joy, more laughter and more belief in hope. I find myself believing in myself more. In little steps, rediscovering my physical voice. Testing edges and trying again to find my role in this collective of fiercely compassionate women. Wanting to learn the edges and boundaries. Wanting to work on speaking…and being not just heard but understood. Right now… I am my biggest stumbling block, but I feel ready to take it one. I know that there is support and respect and they are genuine. At the end of the day, I realize how comfortable I am. I have a job doing what I love, with people I deeply respect and admire. And I am scared shitless about messing it up… I stand on the edge, and know that I have wings, that I have the will to fly…. If I just have faith. So tomorrow is it – the first time I teach a Zumba Gold ® class on my own. I’ve done a sone here, and a song there, and been working long and hard on this. The journey has not been without its share of potholes along the way. I’m certain that there will be great joys and great moments of OOOOOPS that happen tomorrow along the way – but it will be a day surrounded by friends and family in one 45 minute class. As of tonight – there is one song that just has my brain cramped but by tomorrow it will either be learned – or ad libbed!